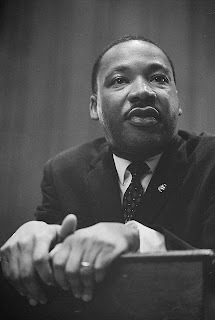 To those that took today off to celebrate the life of our greatest civil rights leader, Happy Martin Luther King day. I made my annual pilgrimage downtown to Margaret T. Hance park to participate with hundreds of others. It was a great celebration and I'll post more about those festivities later. But I want to take a moment to thank Martin Luther King and all the other leaders that helped in the fight - Malcolm X, Hewey Newton, Angela Davis, Coretta Scott King, Bayard Rustin, A. Phillip Randolf, The Black Panther Party, Marcus Garvey just to name a few. Also please remember those thousands of individuals that sacrificed life and limb so that our world could be just a little bit better. With each generation, the world is getting more and more color blind. But I'm still a realist and know we still don't live in an ideal world. But hallelujah, look how far we've come.